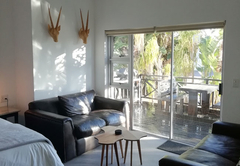 Sunshowers Plett is a 4 star graded B&B with self catering option, offering Plettenberg Bay accommodation for tourists and visitors of on the Garden Route. 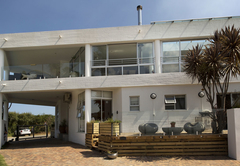 Sunshowers Plett is a modern and spacious, 4 star rated guesthouse, with glass balconies, a haven to relax in. 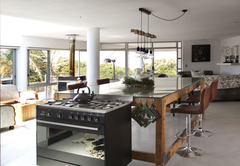 The upper balcony has an indoor gas braai, adjacent to the spacious lounge. 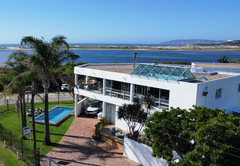 From the lounge you have a 180 degree view of Lookout beach, the ocean, Outeniqua mountains and the lagoon. 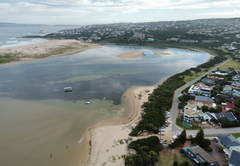 The lagoon forms a stretch of sand which is becoming more and more popular as a swimming area. 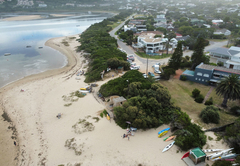 During low tide you can cross the lagoon to a newly formed 'lookout beach'. It is amazing to see the tides coming and going. 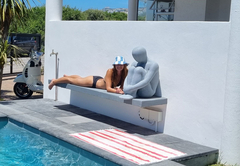 This is an excellent spot for a day in the sun, and all of this is only 75 meters away! 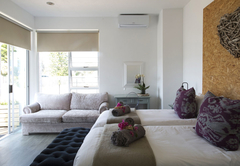 From the minute you walk into Sunshowers Plett you will be pampered with personalized service and hospitality. 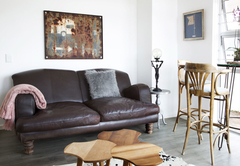 Our staff will gladly assist you with reservations, enquiries, and will see to your every need. 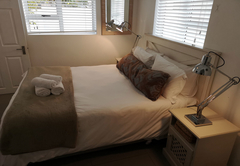 It is a privilege for us to have you staying with us. 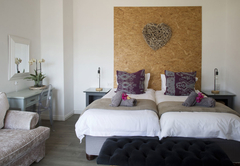 Sunshowers Plett consist of six spacious bedrooms, modern and stylish decorated. Room 5 and 6 have a 180 degrees seaview! 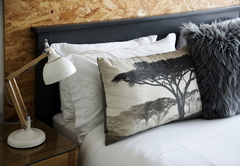 All rooms are equipped with DSTV, aircon, wireless internet, safes, fridges, kettles, complimentary coffee, tea and homemade biscuits. 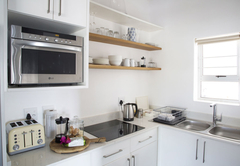 Room 2, 3 and 4 are also fully equipped for self catering, including microwaves, hotplates and frying pans. 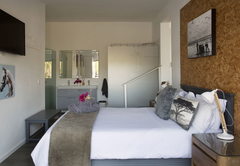 These rooms have sliding doors leading to a deck, which is super for braais! We supply a Weber braai on request. 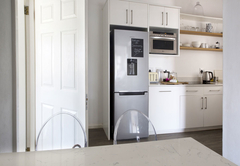 The units are serviced everyday at no extra charge. 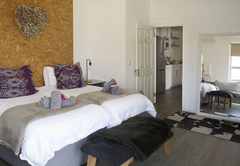 De Lux Double: Double bed, with en-suite bathroom with shower. It is our smallest room, but warm and welcoming. Sliding door to the beach! 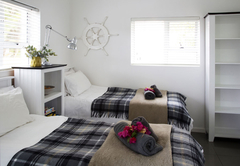 De Lux Twin: A spacious bedroom with twin beds, which can be made into double if requested. En suite bathroom with shower. 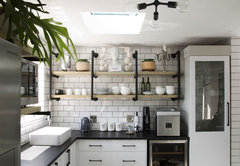 Fully equipped kitchenette. This can be reserved as either breakfast included or self catering. De Lux Queen: Sunny and adorable!! 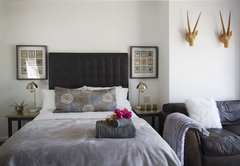 A Queen size bed nestled in the most beautiful decorated room! En suite bathroom with shower and bath. 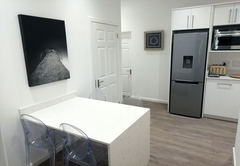 Fully equipped kitchenette. This can be reserved as either breakfast included or self catering. 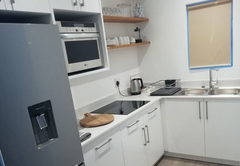 De Lux self catering unit. 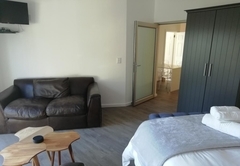 This family unit consists of two bedrooms, one double and one with two single beds, two bathrooms each with a shower, open plan lounge, kitchen and dining room area. Comfortably sleeps four. 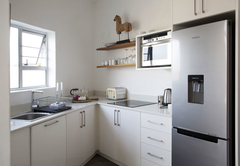 Fully equipped kitchenette. 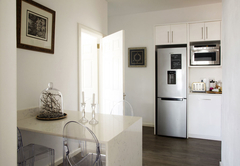 This unit can be reserved as either self catering or breakfast included. Sliding door opens onto a private deck. 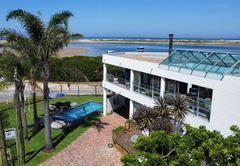 Braai, relaxing evenings on the deck in our superb weather with the calming sound of the ocean in the background! 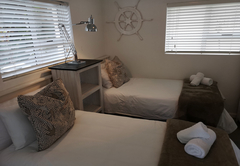 Superior King: Sea views! 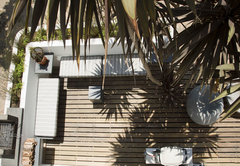 Spacious with own private balcony overlooking the ocean!! Popular as a honeymoon suite! 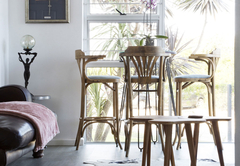 This room is meant to relax and unwind in!! A King size bed, ample cupboards, spa bath, lounge area, and laid back furniture on the balcony - this room will satisfy your every need. 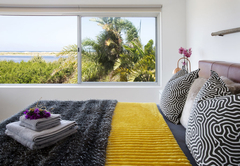 From this room you can view amazing sunsets and sunrises. Private and secluded. Superior Twin: Our latest addition - and this is stunning. 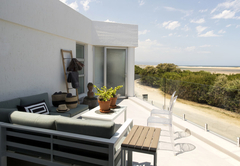 Decorated in white, overlooking the ocean, unspoilt views. En suite bathroom with shower, walk in changing room ... the best of the best! We have beach chairs, and surf boards to your disposal. Beach bags with towels, bats and Frisbees are available in every room. Our legendry breakfasts are served daily from 08:00 to 10:00 and beside serving a full English and full continental breakfast, we also like to treat our guests to freshly baked bread, muffins, oondkoeke (which is the south African equivalent to rolls), and scones. Fresh fruit salad is prepared every morning. We will gladly cater for anyone with dietary preferences. Nothing is to much trouble, your wish is our command! 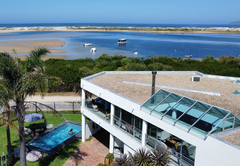 Situated on the lagoon-front at the mouth of the Keurbooms River Lagoon, and only two minutes drive from the town centre, shops, restaurants and swimming beaches. We had an amazing honeymoon. 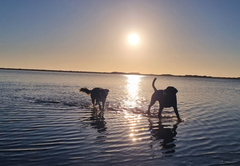 Our early morning walks on the beach before our scrumptous breakfasts will never be forgotten. Lindy, thank you for everything. You really made our stay special for us. We will definately be back, hopefully sooner than later. 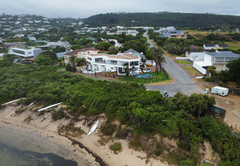 Response timeSunshowers Plett typically responds to requests in 5-10 minutes.